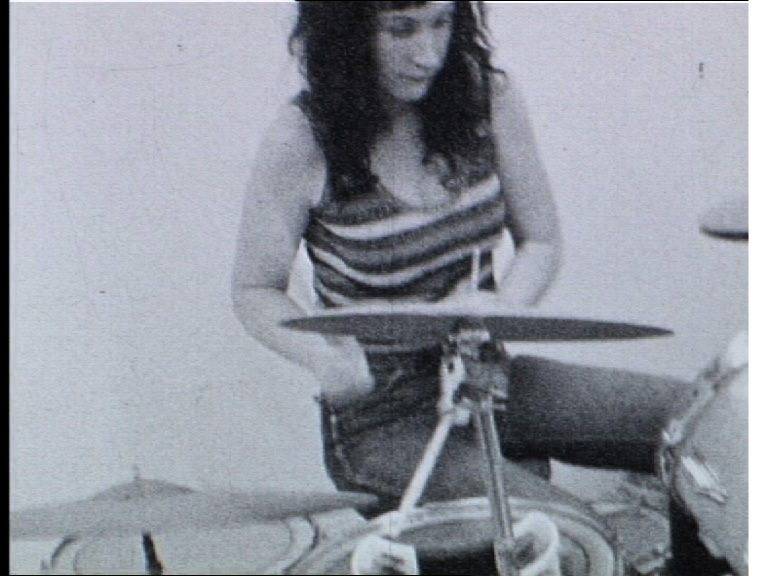 Stella Corkery was the first female drummer I ever saw live, this was in New Zealand where I grew up, and lady drummers were pretty thin on the ground. I’d snuck into the local pub when I was 17 yrs old, and got to see her play with all female band Fake Purr, who in turn influenced my own journey into music. 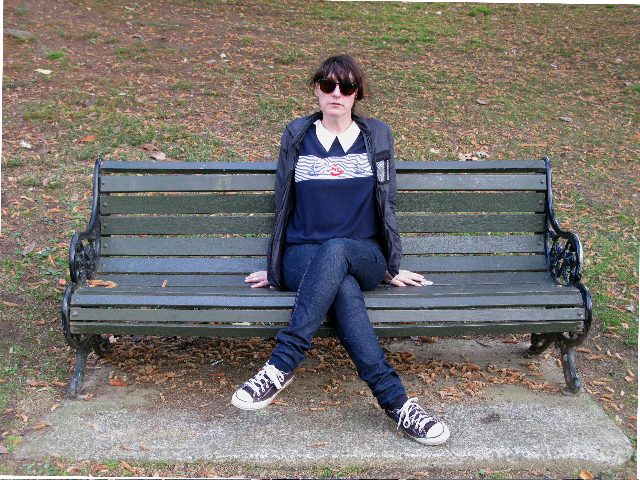 Stella is a designer, artist, and multi-instrumentalist that has played with people from some of the most influential bands to come out of NZ. She is an inspirational lady indeed, I recently caught up with her in a different time zone. Where were you born: Tuatapere, Southland, NZ. Where do you live now: Auckland, NZ. Bands you are drumming in currently:White Saucer since 1993, a duo with my partner Alan Holt & my solo project, Arrows, since 2008 (previously Sweetcakes which began in 1994). People and Bands you were drumming for/collaborated with in the past: My very first band was formed in Dunedin maybe around 1980 – “The Pleats” with Rachel Shearer (Lovely Midget), Debbie Hinden (Indigo Underworld ) and Erica. We had a definite all girl early 80’s vibe. We didn’t make it to the playing live stage but we recorded. I was super shy and just managed to shake something. Rachel, Debbie and I went on to form Angelhead with Michael Morley (Dead C). Angelhead moved to Auckland in the late 80s where we played a few shows and release a cassette on my friend Bruce’s label Xpressway. I also joined Michael and Mathew Hyland (Spud, Mean Streaks) in an outfit called La Motta. When Michael returned to Port Chalmers Rachel, Debbie and myself formed Queen Meanie Puss with a great angular guitar player called Dieneke Jansen (If, Teeth). QMP has been described as avant girl goth. We played about for awhile, had some good times and recorded two 7”; one for Flying Nun and another for Siltbreeze. We wrapped it up when Rachel relocated to Germany for a few years. I had moved into a huge warehouse by 1992 right in the center of town. There were very few noise restrictions so we had a fully functioning practice space. I played drums with my partner Alan Holt and Roddy Pain ( Snapper Evil et al) in Hot Buttered Soul, my first improvisational band. We did that for a couple years and when Roddy left I joined Alan’s solo project White Saucer to make it a duo. My solo project Sweetcakes was also up and running around this time and I’d begun to experiment with recording improvised musical pieces. My imagination was captured by the early Smog recordings of that time but what really kicked me off was Yoshimi P-We’s Speaker/Tuna Power 7”. I’ve never been a song writer in the traditional sense and felt kind of type cast by the drum kit, like being in a creative rut I didn’t know how to work my way out of until I heard Speaker. This was a revelation to me. Here was a female drummer I could relate to and respected making her own sound, staking her own place as a creative entity, making musical history, playing whatever instruments she liked. At about the same time Riot Grrl sounds were hitting Auckland, which was also really exciting. The rebellious sound and revolutionary attitude was very appealing. I got together with three other musical girlfriends, Stephanie Cook, Brenda Dwayne and Bridget and we formed Fake Purr. We were inspired a whole lot by Slant 6. When Rachel returned from Europe I continued to work with her as a guest on a number of her Lovely Midget releases and soundtracks. In the early 90s Alan and I started the Pink Air and Girl Alliance record labels. We worked closely with the bands, often recording them, putting on shows, designing posters and record covers. Alan worked for Flying Nun at the time too so he had a lot of knowledge to share. Currently my musical activities are my solo project, with the new name Arrows, and performing and recording with Alan in White Saucer. Sometimes we put out a run of lathes for both projects. Other fun collaborative projects include White Saucers remixes for Auckland band Xanadu where we remixed recordings of an entire unreleased album and Coco Solid’s track Marz Attaxxx. Both of these remixes were droned out crazed psych attacks! Tom Tom Magazine:What you do for a living? Stella Corkery: For a long while I designed clothing and ran boutiques now I’m studying Fine Arts and working in a Fine Arts Library. Tom Tom Magazine: When and why did you start the Pink Air/Girl Alliance record label? Stella Corkery: Pink Air came first as an experimental label. There were so many amazing 7”s being released in those times of the early 90’s it was inspiring. I called the label Pink Air – asking myself if air was psychedelic what colour would it be ?! The first lathe 7” was my percussion only release – Pink Drums. I wanted Pink Air to remain representative of what was experimental and psychedelic from around that time in Auckland. I favoured small runs of lathe cuts whose sounds fitted with my aesthetic. The small runs also gave some of the artists enough time to be able to put together handmade covers creating some great personalized artifacts. Girl Alliance followed shortly after and was a different thing altogether. It was a purely Riot Grrl label but this did not mean the music wasn’t experimental. When I first heard Kerikeri band Goldifox they really hit me over the head. On the first listen I immediately realized it was the sound I had been waiting to hear from a group of NZ girls for years. Kind of a mixture of The Clean, The Germs and Bikini Kill. I felt they were important and needed to be documented on vinyl. There was also a purity in their form. They were teenage girls from a small town in NZ, lo fi recordings made on a ghetto blaster in their bedrooms. Their vision was clear. Goldifox had a sort spin off band called The Jewl of Bessamoocho, where Amy stepped away from vocals and their Japanese exchange student friend – Eri Miyabayashi – stepped up to write songs and sing. Penny Collins continued to play guitar and Liz Mathews continued to drum. Eri’s perspective and mysteriously weird, deep and accented voice gave these songs a dreamy, but still punk quality. They were the second GA release. The third and final release was The Coolies self titled 7”. They were the zeitgeist riot girl punk band of that moment in Auckland and the single captured a great and vital moment in their history. The whole Auckland RG scene lasted from about 1995-2003. Tom Tom Magazine: Women in music can be both extremely competitive and extremely supportive. What has been your experience in NZ being supported as and supporting other women in music? have come to the conclusion competitiveness and supportive-ness is not gender specific. Tom Tom Magazine: Do you think female drummers in NZ are looked at and have a different experience than women in the States? Stella Corkery: I don’t know enough about the American experience to be able to compare. Tom Tom Magazine: When did you start playing the drums? Tom Tom Magazine: I always wondered if it took longer for women to feel like they were “real” drummers? Did you feel this way when you were first starting out? Stella Corkery: I think I had an epiphany early on that drumming was going to be the thing for me. I loved music and it felt real straight away. I was shy so behind the drum kit seemed like the place to put myself. Even as an awkward beginner it was fun and challenging in a good way. In the early 80’s I was living amongst a community of musicians and running an independent Arts Collective (Chippendale House) with David Kilgour and Michael Morley so it was an easy thing to do – to be in a band. I was sharing a house in Port (Chalmers) with Michael, Rachel and Bruce Russell, sharing the practice room with The Dead C and watching Bruce make up his first Xpressway cassettes. They were formative times. ‘Real’ drumming is perhaps a suffocating term. I am deliberately self-taught; I definitely wanted to make my own path. I listened to other drummers (Robbie Yeats was of course inspiring) and music in general and found inspiration from that. I very rarely played along with records, usually absorbing what I heard and interpreting it in some way that suited me or my band. I really wasn’t that interested in being ‘good’ sometimes I liked the tension of being ‘bad’ and still do. I was listening to rock drumming all the time but it was when I first discovered Milford Graves that my playing really opened up. He was the springboard for all my improvised, free or noise drumming. Free drumming was/is a great way to confound expectations of who a drummer should be. Tom Tom Magazine: What is your favorite set-up for your kit? Why? Stella Corkery: I have an old Rogers kit, it’s a pretty straight up set up. Kick, floor tom, top tom, snare, high hat, 3 x cymbals. I add a floor tom sometimes and percussion. If I am playing percussion it’s usually while I’m seated at the drums and I’m just playing them by hand and still playing the relevant kit parts with my feet. I’ve been using the kit much more as a percussion instrument these days too. That’s fun. Tom Tom Magazine: What would your dream kit consist of? I’m getting used to managing that. Tom Tom Magazine: Do you do any warm-ups before you play? Stella Corkery: Usually just a couple of beers or scotches if I’m nervous or bored. Tom Tom Magazine: You’ve played in some many different formats of band, have you ever felt a consistent role as a drummer? Stella Corkery: I feel like I am a drummer but I am also a musician. Tom Tom Magazine: Do you play any other instruments? If so … how does that effect your drumming? for recording. I’ve just bought an old drum machine and we already recorded with that and will incorporate it into live performance soon. We have a lot of instruments at home; guitars, violin, stuff to hit and shake, vintage electronic gadgets and so on. I really feel like branching out and getting away from the kit when playing live these days. I would like to move around the performance area more making a variety of sounds. So I like to think I could bring that to what I do with White Saucer. Tom Tom Magazine: What’s your favorite part about playing drums? as a drummer – and listening to what everybody else does – I feel like I’m in a unique position to move things in a direction that I can ‘hear’, helping to write the song. When you are playing with a group of people and the collective chemistry is working it’s a really good feeling. Tom Tom Magazine: Favorite show/shows you’ve played? Chalmers – so great. Previous to that we had some awesome Girl Alliance shows………when the Auckland Riot Grrl scene was both germinating and peaking the shows were always some crazed super energy fun. Tom Tom Magazine: Have you experienced any setbacks as a female drummer? maybe in different ways sometimes. I don’t think mean or competitive people discriminate. Perhaps when the RG times were going strong there may have been a few people upset by that or couldn’t understand but from what I remember most everyone was having a really good time. Tom Tom Magazine: Who are some of your favorite bands right now? Stella Corkery: Magik Markers, Sun Araw, Stag Hare, X’e, Bang! Bang! Eche! Tom Tom Magazine: Who are your favorite drummers? Stella Corkery: Adris Hoyos, Ikue Mori, Marge Marshall, Milford Graves, Lesley Paris, Aaron Hemphill, Julian Gross, Robbie Yeats, Yoshimi P-We. Tom Tom Magazine: Where do you shop for your drum gear? I’ve found such a limited selection in NZ, and most of it is outrageously expensive. Stella Corkery: I have bought most everything second hand except for percussion bits. The last drum kit I bought, a Rogers, was from a pawn brokers called Harmony House. They were on Karangahape Road in the early ‘90’s. It is still the kit I play. It came with an old Ludwig snare so that continues to keep me happy. Harmony House had so much great band gear, everybody bought from them. Tom Tom Magazine: Any advice for girl and lady drummers out there and those thinking of taking it up? Stella Corkery: I bought my first kit from my brother and he said – don’t be afraid to hit them. What a great interview, thanks! Stella’s a legend!